The metropolitan Mumbai is every time pictured as the city on the move. Quite literally, the city continues its active course in the day and night as well. Enjoying the compact blend of the traditional and the modern, this commercial capital of India is the dream destination for many tourists. 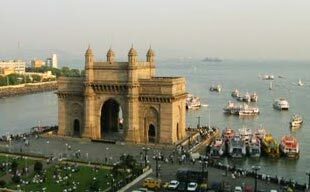 The glamour and glitz of Bollywood in this city is an added attraction of Mumbai city tour. The spectacular array of Victorian buildings, the seaside rendezvous of the retreating beach and the maze of alleyways make Mumbai a magical tour to experience. The iconic heritage of Chhatrapati Shivaji Terminus, formerly known as Victoria Terminus is an outstanding specimen of Victorian Gothic Revival architecture in India. Popularly and colloquially known as VT station, this world heritage building marks the westernmost end point of Central Railways of India. Mumbai's most striking archway, Gateway of India, an Indo Saracenic structure was designed by George Wittet. It was built to commemorate the visit of King George V and Queen Mary to India in 1911. Tourists visit this heritage gate to cruise 9 km south west towards Elephanta Island. As tourists are ferried from the Gateway of India, they encounter the seventh-century rock-cut temples of Elephanta. Named by a Portuguese as island Elephanta after he discovered a large stone elephant near the shore, these world heritage caves present the ancient heritage and are a must visit attraction to begin the Mumbai city tour. Chowpatti Beach is another iconic sight of Mumbai tour. Tourists from different regions turn up to this beach and experience multitude of people and beachside vendors offering specialties of Bhelpuri and Kulfi alongside the mesmerizing Arabian Sea. Marine Drive, a beautiful boulevard is fondly called as the Queen’s Necklace for the illuminated C shaped arc along the natural bay at night. 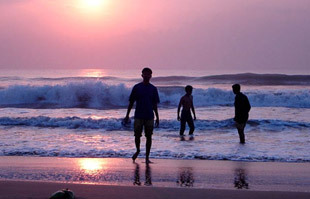 Juhu, famous for a suburban beach is a great favourite amongst tourists. One can relish famous Mumbai’s street food in Juhu with innumerable food counters alongside beach. Many tourists make it a point to visit the beach when they come to Mumbai, as it is a relatively free space in the city, although it does get crowded in the evenings and weekends. Mani Bhawan used to serve as a retreat for Mahatma Gandhi during his visits to Mumbai between 1917 and 1934. Now, this heritage building is converted into a simple museum where the belongings of Mahatma Gandhi including his books are exhibited. Colloquially known as Chhatrapati Shivaji Maharaj Vastu Sangrahalaya, Prince of Wales Museum is Mumbai’s biggest and best museum exhibiting terracotta figurines from the Indus Valley, impressive Hindu and Buddhist sculpture, miniature paintings, porcelain and some particularly vicious weaponry. Projected as a melting pot of Islamic, Hindu, Jain and British architecture, this museum was inaugurated in 1923 to commemorate King George V’s first visit to India in 1905, while he was Prince of Wales, hence the name Prince of Wales Museum. This unique building was designed by George Wittet who also conceived and designed the Gateway of India. This is nothing but a 136 year old open air laundromat settlement near Mahalaxmi. Dhobi Ghat is also considered Mumbai’s oldest and biggest human power washing machine, beating dirt out of clothes in 1026 open air troughs. Tourists visit this site to capture the rhythmic actions of washer men dedicated towards their job. By Air – Mumbai is another most preferred city for international tourists. Most flights from different international zones operate towards destination Mumbai. By Road – It takes three hours from Pune to reach Mumbai. By Railways - Mumbai is effectively connected with the rest of the country & is a part of Central railways hub. It also runs on a network of local train service. Climate of Mumbai – The weather of Mumbai is hot and humid. The pleasant time to visit this metropolitan is during November to March. The twin hill resorts of Lonavala and Khandala are one of the most availed excursions from Mumbai. Located in the Sahyadri’s dramatic landscape, a visit to these hill stations provide tourists a contrasting relief in the form of verdant mountains and wishful waterfalls. Welcome to the no vehicle zone of Matheran, an eco sensitive hill station. This doesn’t mean that tourists cannot avail any transportation. They surely can hop onto the Mountain Railway from Neral to visit Matheran, where many panoramic points and exotic scenery are waiting to be explored during the scenic train journey. The 38 designated look-out points and miles of quiet walks here make it a nice resort for trekking. Sanjay Gandhi National Park and Kanheri Caves comprise a protected 104 sq km stretch of green hills and forests. As the name suggests, the national park accommodates abundant flora and fauna. The main attraction in this wildlife resort is the famous Lion Safari. Kanheri Caves on the other hand comprise the cave circuit of Maharashtra. The cave complex features 109 caves belonging to 2nd and 9th century as viharas (monasteries) and chaityas (prayer halls). Located 61 km away from Mumbai, Karnala is a birdwatchers’ paradise allowing them to capture the sight of variety of bird species including rare species of Ashy Minivet, three toed kingfisher and Malabar Trogon. Apart from them, tourists can catch views of over 150 bird species.